True Grace Outreach is a non-profit faith-based prevention outreach for girls who has partnered with GACCS. TGO’s programs are set to engage the young girls in healthy activities mind, body and soul to provide opportunities for personal, social and physical growth. TGO strives to teach them how to meet physical, emotional, financial, and spiritual needs and to guide them towards healthier lifestyle choices physical and mental. 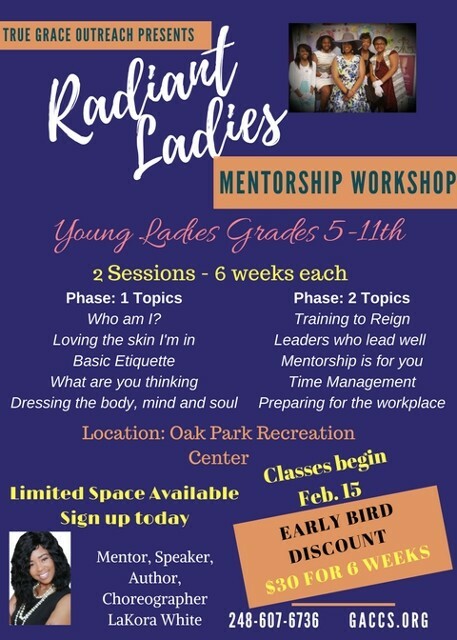 One of our programs is Radiant Ladies Mentorship. An Arts combined with ethics with 2 Phases of 6-week workshop series that are relatable and empowering for young girls (Grades 5-11). We have a 12-month webinar based mentorship program "Radiant Ladies Check-in " that trains to reign in this generation via Monthly live video webinar conference meetings. This includes leadership study groups, group discussions, mentorship training etc. Destructive habits can be traced back to poor choices which stem from poor self-esteem. Through these programs, you will see young ladies develop into strong women that stand up and stand out for what is right with grace. Walking in the impossible, because that's what we are created to do.